Posted November 19, 2006 in 2006/11, 3 Timely, Assorted, Periods, Restoration, Topic, z Archive. I do not think I will surprise anyone by observing that the early Timely comics are high price items, particularly the key issues. 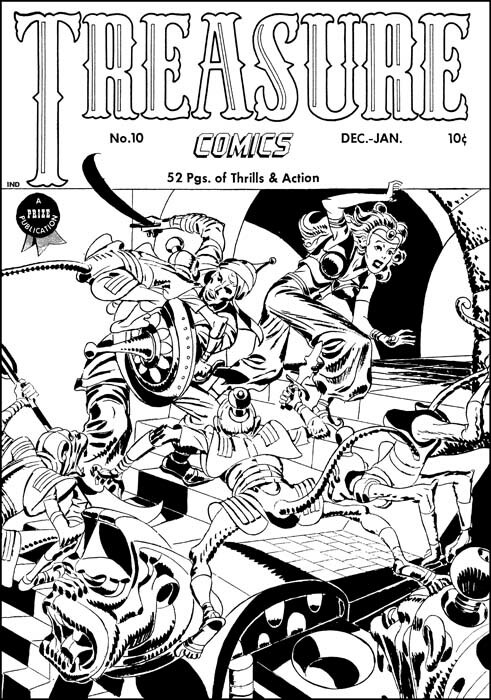 There are probably very few, if any, comic book collectors who can afford to purchase complete runs of early Timely comics. 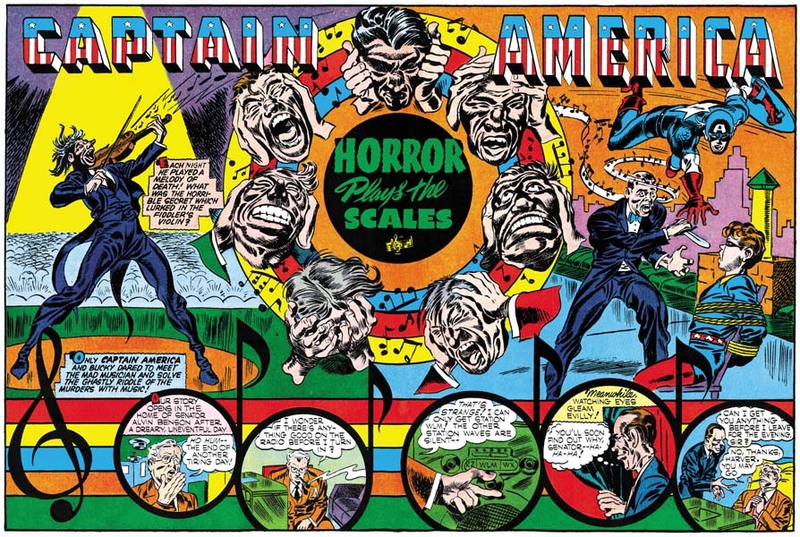 That is why I am grateful that Marvel has reprinted some of them in their Marvel Masterworks Golden Age series. I would like my readers to always keep this in mind as I write some negative criticism on one of these books, The Human Torch Volume 1. I have recently been able to scan a coverless but not too beat-up copy of Human Torch #2. That is actually the first issue for that title as it took over the numbering from the defunct Red Raven Comics #1. Seeing the original comic was a revelation. 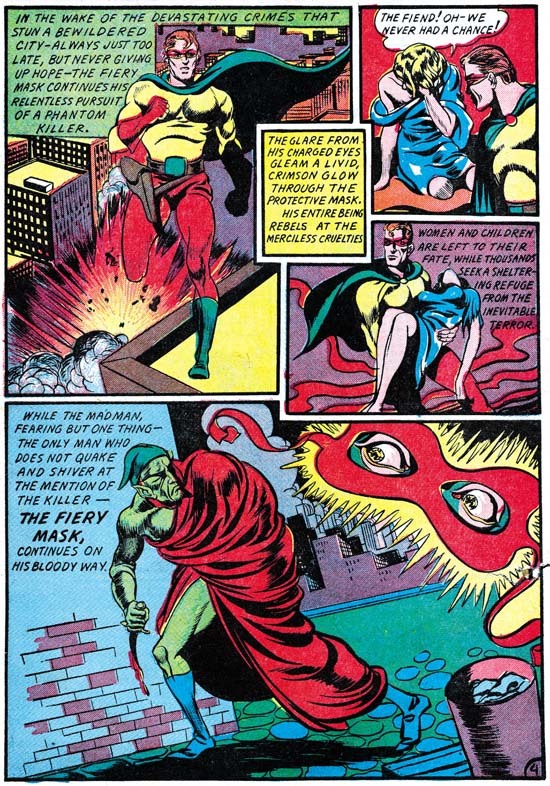 In Chapter 2, “Before Kirby” of my serial post on The Art of Joe Simon I discussed the Fiery Mask story by Joe Simon. I included an image of page 5 scanned from the Masterwork book. You can see the image I used below. 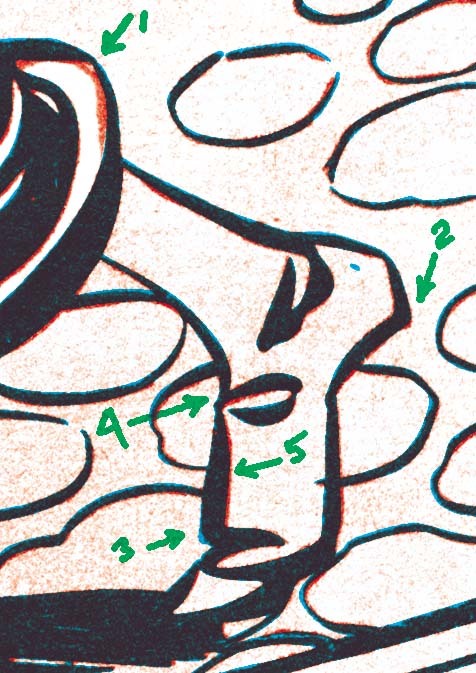 I have since replaced it with a scan from the original comic, which you can see above. Take the time to compare the two images. Even with the relatively low resolution that is needed to include in this blog page it should be pretty obvious the difference in quality. The reprint version looks rather blurry. Because of the glossy paper used and the modern printing technology this cannot be blamed on the printing. Rather it looks like it was re-inked with an insensitive hand. Joe did a much better job inking this story then you could tell from the reprint. 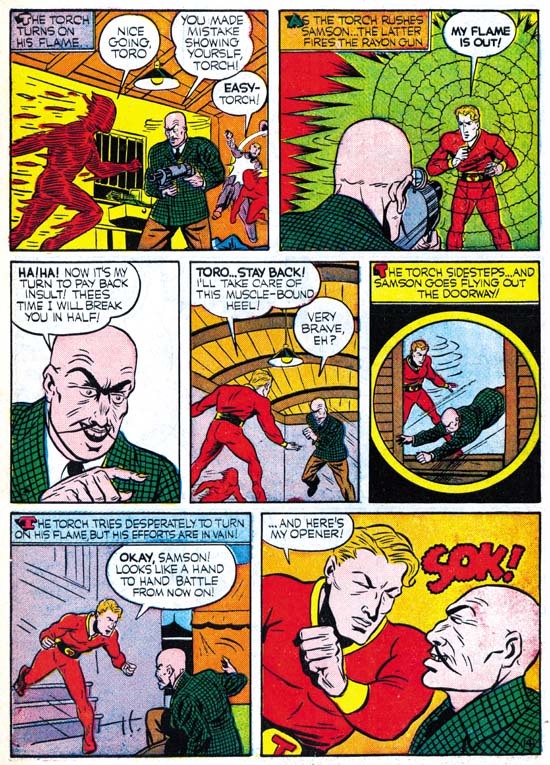 The Human Torch #2 (Fall 1940) same page as above as reprinted in Marvel Masterworks. Simon’s story was not the only story to be adversely affected by the poor art restoration. Actually all the features in this comic look so much better in the original. Colors in Golden Age comics just can not compare with what modern presses can produced. Yet the colors in this reprint are actually inferior to the original. I could not resist including an image by Carl Burgos. Not because it shows how much better the original art was, since the reprint’s job on this page was better then most. I include it because it is such an great example of Carl’s excellence at telling the story. 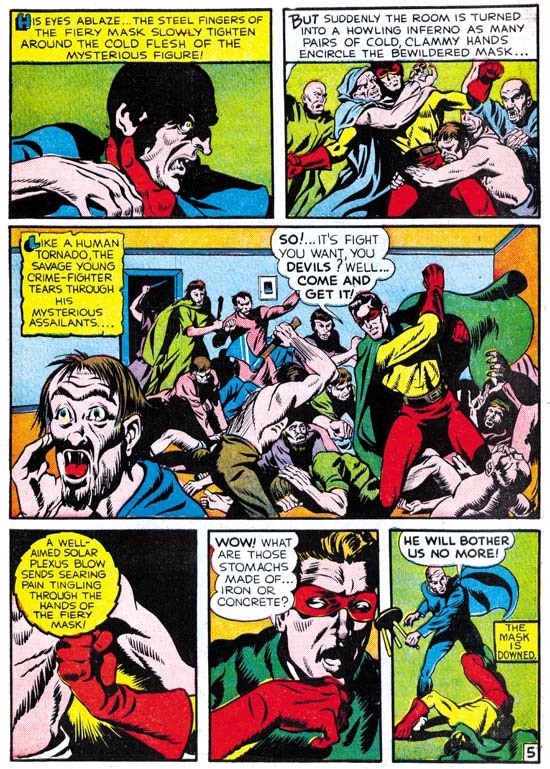 His progressing from the entrance of the Human Torch, the weapon removing his flame, the villain issuing his threat to the now disarmed hero, and ending with the Torch showing what he can do with his intelligence and courage. The only problem I have with this page is the awkward use of the circular panel. In a few months Simon and Kirby would show the right way to use this device. Sometimes the differences between a masterpiece and a more routine piece of art is actually very small. 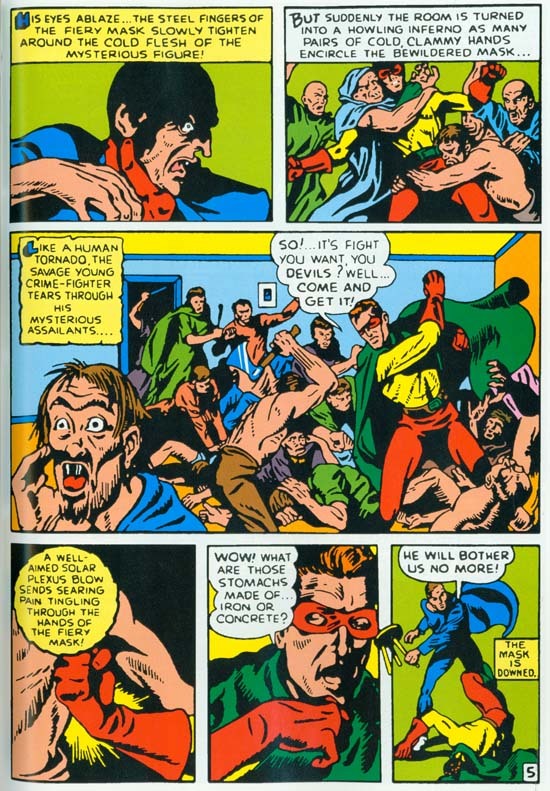 When I originally read Everett’s Sub-Mariner story in the Masterwork volume I was not very impressed. Do not get me wrong, you could tell Everett was doing a great story telling job. But the art itself did not do much for me. 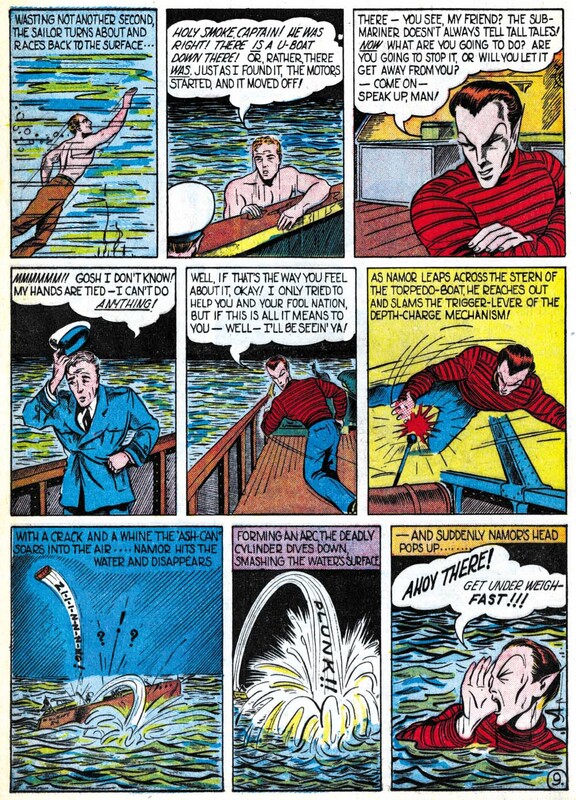 In my opinion none of the stories in this comic suffered as much as Everett’s from the reprint. The reprint inking was not any worst in Sub-Mariner but it completely masks what a masterpiece this story really is. Even the image I provide above does not do it justice, but I hope you can get a better idea from the enlarged image. I am not able to compare the reprint with the original for the other issues in the Masterpiece volume. But it sure looks like they suffer from the same problems. I want to repeat what I said above, that even in the current somewhat poor restoration this Masterwork volume is a welcome addition to a fan’s library. But it is a shame that Marvel missed a chance to provide a volume that could have been absolutely amazing.